Space Weather at our Doorstep: How Can We Detect it? Space weather is a complex field of study and can be a difficult term to define. According to NOAA’s Space Weather Prediction Center (SWPC), space weather is described as the variations in the space environment between the sun and Earth. Other planets have space weather, too. In fact, we have been able to witness space weather – like aurora – occurring on Jupiter, Saturn and Mars! Because space weather is, in large part, a result of our sun-Earth interactions, many aurora we see are a result of events occurring on the sun. The sun spews solar material, like plasma and solar wind, toward us every day through the eruptions of solar flares and coronal mass ejections from its surface. This solar material comes from plasma processes occurring around the sun’s coronal holes. All of these things – solar flares, coronal mass ejections and what happens around coronal holes – birth many space weather phenomena, like aurora, that end up affecting us here on Earth. When terrestrial weather is occurring, you’re often able to tell because you can see it – like rain or snow. Although we can feel the impact of many of space weather phenomena, the events themselves are invisible to our eyes. We can’t see when they impact our atmosphere so how can we tell when they are occurring? And, how can we tell when these events impact Earth? Space weather forecasters rely on satellites to detect space weather events occurring near and far in space. The Advanced Composition Explorer (ACE) provides us with near real-time coverage of solar wind parameters – how solar wind impacts the near-Earth environment greatly impacts how we are affected by space weather. ACE is important in detecting particularly impactful space weather events, which can result in geomagnetic storms, as its instruments can provide us with a one hour advanced warning of anything coming. Geomagnetic storms often trigger aurora. The Deep Space Climate Observatory (DSCOVR) detects space weather events occurring around us in near-Earth space. DSCOVR is set to replace ACE and, in doing so, will provide us with continuous solar wind observation data going forward. DSCOVR will deliver real-time data for space weather predictions 100 times faster than ACE, or any other existing spacecraft in this orbit. Let’s take a look at solar flares: what are they? According to NASA, solar flares are an intense burst of radiation coming from the release of magnetic energy associated with sunspots on the surface of the sun. Solar flares are our solar system’s largest explosive event and can last from minutes to hours. To detect solar flares, you need to be using instruments that can capture images in short wavelength radio waves, like x-rays. The GOES satellites have instruments like this and can capture data that helps us monitor solar activity and solar flares. Want to see the kind of data we get? Take a look at Figure 1, which includes GOES Primary x-ray flux data. 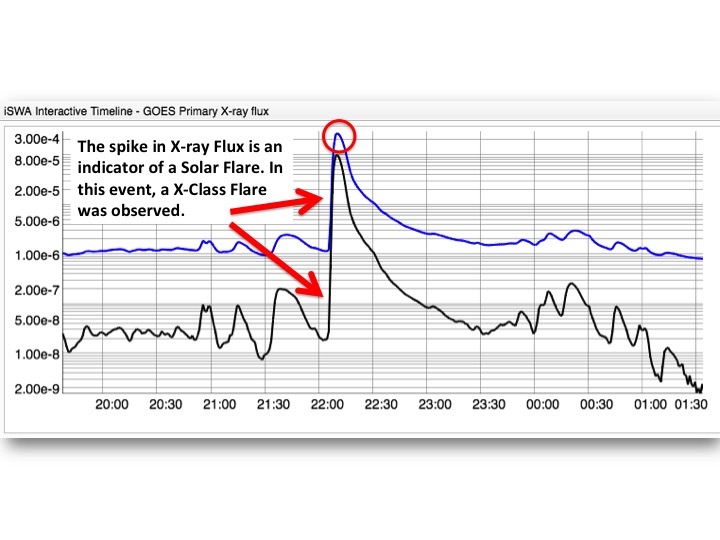 You see the sharp increase in x-ray flux? That’s an indication that an X-class solar flare occurred. There’s another fascinating method in which we can detect solar flares – our own eyes! We can watch for them on video data from solar orbiting missions, like the Solar Dynamics Observatory or SDO. SDO provides continuous, full-disk observations and videos of the sun. In viewing this footage, you can actually watch a solar flare happen as it unfolds, right before your eyes. The Solarium, a video art installation created by the NASA Goddard Space Flight Center (GSFC), uses SDO footage to create a mesmerizing floor-to-ceiling viewing experience of events captured on the surface of the sun. The Solarium exhibit travels around the world – if you’re interested in experiencing this one-of-a-kind exhibition, check out its exhibit schedule (listed on its website, hyperlinked above) or experience it in Greenbelt, Maryland at the NASA GSFC visitor center. We’ve also included a short clip from SDO, below. Check it to witness a solar flare event caught on camera! The bright flash is the solar flare occurring! Figure 2: SDO Video Footage of a Solar Flare! 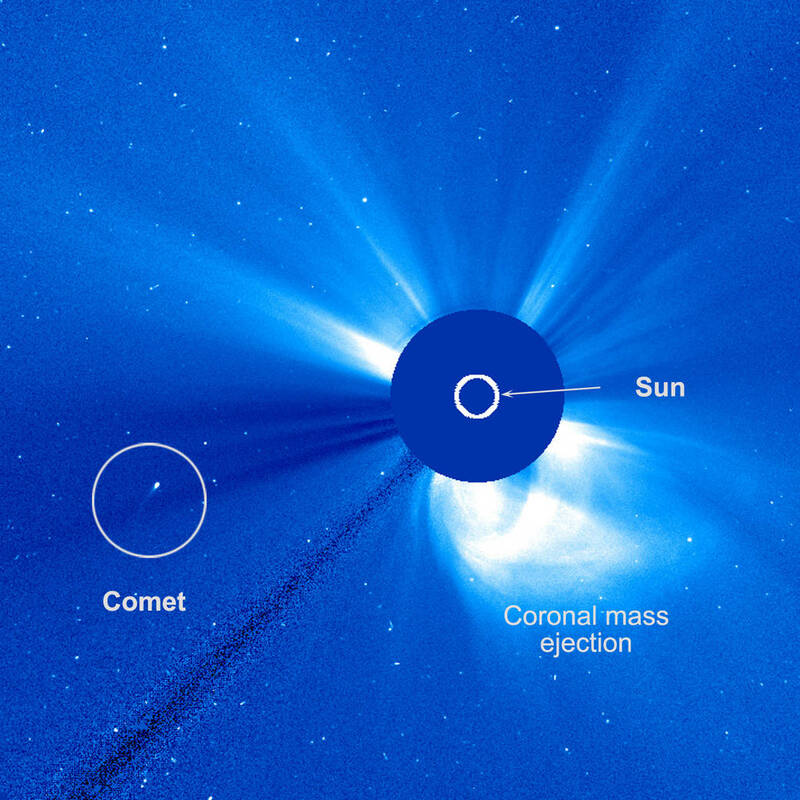 Another solar phenomenon that can have a big impact on space weather are coronal mass ejections (CMEs). CME’s are huge explosions of plasma entangled in broken field lines from the Sun’s corona and often occur during long solar flare events. Typically, CMEs travel outward from the Sun at speeds of about 300 km/s (kilometers per second). But, they can be as slow as 100 km/s or faster than 3000 km/s. Sometimes, CME events on the surface of the sun are aimed toward Earth and impact our atmosphere. How do we know when a CME has occurred and if it has impacted Earth? The Solar and Heliospheric Observatory (SOHO) and ACE missions help us with this! SOHO provides us with constant images of the solar corona and is able to capture when CMEs erupt – see an example of one of these powerful eruptions captured by SOHO in Figure 3, below! Figure 3: SOHO Captures A CME! Depending on the speed of the CME, it could take anywhere from a few hours to a few days before it hits Earth. 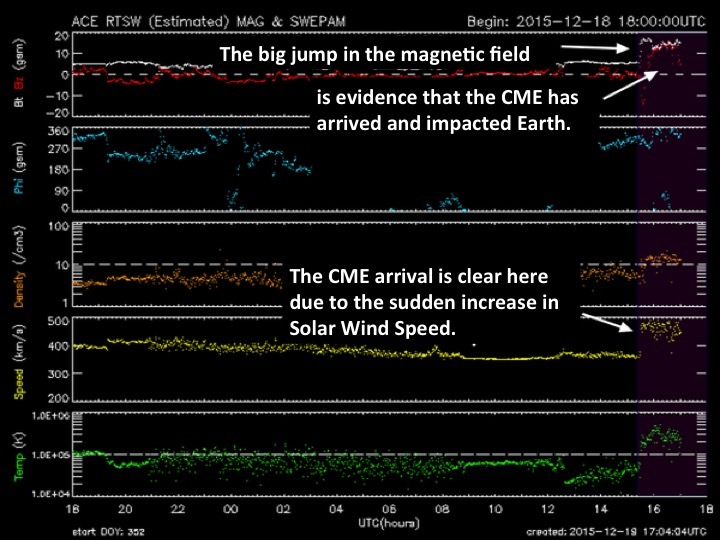 Due to the uncertainty of timing, space weather forecasters rely on ACE solar wind data to determine when the CME has impacted Earth. Looking at Figure 4, we can see the sudden jump in solar wind speed (in km/s) and magnetic field strength, labeled as Bt, which is the total magnitude of the magnetic field vector, and Bz which is a measure of the North/South orientation of the interplanetary magnetic field. Both are indicators that a CME has impacted Earth. 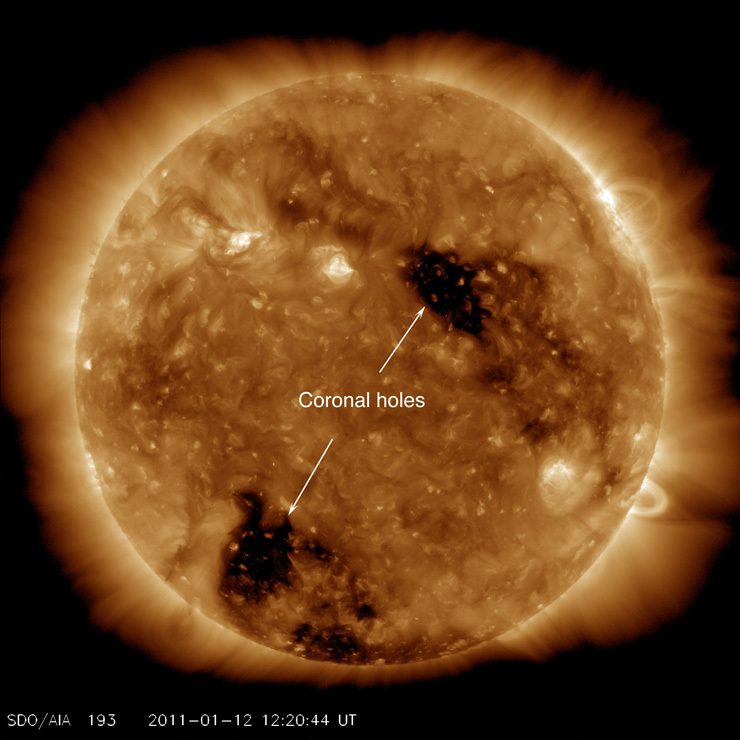 Space weather is also created from events in and around what are sometimes referred to as the sun’s coronal holes. These holes, which appear in the Sun’s atmosphere or corona, are dark regions we can only observe through filtering data in extreme ultraviolet (EUV) and x-ray wavelengths. Although Earth lives in slow solar wind much of the time, it’s the fast solar wind, which originates from coronal holes coming our way, that often affects space weather phenomenon close to Earth. The meeting of the slow and fast solar winds creates something analogous to a big wave moving through a current or stream, so knowing when we might be getting some fast solar wind would be helpful. And, when these coronal holes are facing Earth, they’re capable of hurling a lot of solar material, like plasma, and if it hits the near-Earth space environment, can often cause aurora to appear in our atmosphere. SDO produces some wonderfully beautiful and scientifically important images, such as the one shown in Figure 5 of a coronal hole has forming on the sun’s corona. Although these holes look like giant craters on the sun’s surface, these holes are not permanent. The sun can have several holes or none at all at any time. 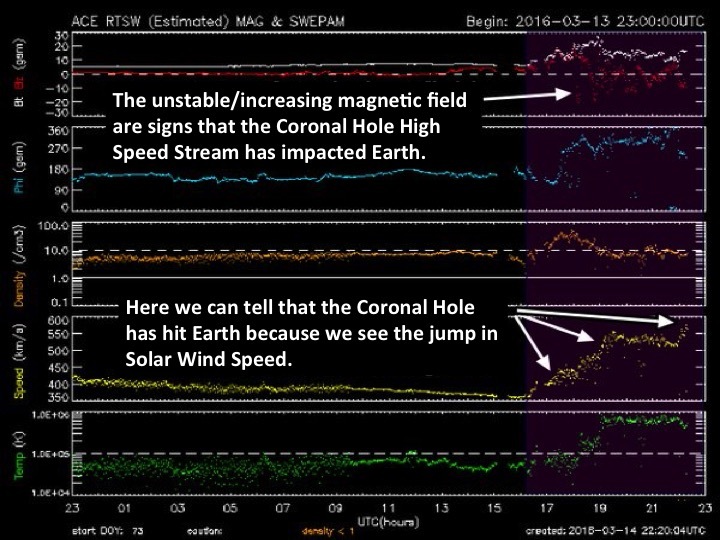 How exactly can we tell when the solar wind pouring out of an Earth directed coronal hole has reached Earth? We revert back to the ACE data in Figure 6 and pay close attention to the solar wind speed (km/s) and the magnetic field (Bt, Bz). Figure 6 shows the steady rise in solar wind and the unstable, increasing magnetic field. Both of these signs confirm that the solar wind from a coronal hole has arrived at Earth. Being able to identify space weather phenomena can sometimes be a tricky and difficult task. Now, we understand how space weather researchers determine when space weather has arrived at Earth. Our next blog post will give us a deeper look into the how impact of space weather phenomena can create aurora. We’ll look at how certain parameters, such as the solar wind and magnetic field data from ACE and other satellites, have helped us understand more about aurora processes. Written by Mike Cook, an education and outreach specialist with Aurorasaurus who is pursuing his master’s degree in Space Studies at the University of North Dakota. Edited by Aaluk Edwardson, a science writer and outreach coordinator with Aurorasaurus who also works in communications and outreach for the Heliophysics Division at the NASA HQ Office in Washington, D.C. This entry was posted in Understanding the Aurora. Bookmark the permalink. Nice blog Mike. You make Millersville proud.